I’m currently reading “A Stitch in Time” by Penelope Lively. It’s a child’s book, and I’m not quite sure why I have it in the house: the story is completely unfamiliar, and the edition is too old to have belonged to one of my children. The book is about Maria, who is 11, an only child on holiday with her parents in Lyme Regis in Dorset. Given the original publication date and the age of the heroine, it is written and set in my childhood, with Maria only a little older than me. My mother too had a patchwork bedspread that she was making at the time, of hexagonal paper piecing setting a flower pattern style. My mother too spent years over it, but when it was finished it was rarely used. By the time it was done, my parents used duvets, and my mother had moved on to American patchwork. I was rather pleased that my answers were the same as other people’s: 21 and =/-3. OK, I didn’t read the Laura Cox report on “Bullying and Harassment of House of Commons Staff” when it was published last week, and to be honest I still haven’t read it now, just seen some of the commentary. But one thing that came out of it was the divide between Labour and Conservative MPs as to whether the Speaker of the House of Commons should stay or go. The Conservative MPs, and websites like Conservative Home and Guido Fawkes, seem to be unanimous that Bercow should step down. In contrast, Labour MPs seem to be uniform in wanting Bercow to stay, at least until after Brexit. LabourList is at best neutral, merely reporting the views of Labour MPs. The New Statesman, in two articles, accuse Labour MPs of making a “grim calculation” but doesn’t express an opinion of its own. While the media are framing the calculation in terms of Brexit, has no-one but me noticed there is a separate Parliamentary calculation to be made? I used to live in the Buckingham constituency: the Speaker, John Bercow, used to be my MP, and I’ve met him a few times. So I can confirm he has neither a halo or a pitchfork: only a mace. When Bercow stands down as Speaker, he will go off to the House of Lords, and a new Speaker will be elected in the Commons. Tradition suggests that the replacement is an Opposition MP. And that there will be a by-election in Buckingham to select a new MP. So an existing Labour MP will turn Independent: and an Independent member will be replaced by a Conservative. Whilst the Conservatives will still not have a majority in Parliament after that, even one extra MP will make the Government Whips job marginally easier, and the Opposition’s likelihood of overturning a specific vote slightly harder. It blasts through the constituency, at a huge environmental cost. It’s made numerous people furious: it got me back into politics. I had the interesting experience of going to a local constituency Labour party meeting when the Shadow Transport Secretary was there: there were perhaps six members, outnumbered by local Conservative types, with cut-glass accents. I’ve also been to various Conservative and UKIP meetings, as well as getting to know some of the local LibDems. So unless there has been a massive change over the last five years, I’ve got an idea about the local views of the parties: and it is not a place that will like Corbyn. Without HS2, a new Buckingham MP would certainly be Conservative. With HS2: who knows? A by-election to replace Bercow in Buckingham would no doubt be bitterly fought, with both LibDems and UKIP having had some constituency machinery in the area, so no certainty for the Conservatives. So my advice to the Government is that if they want a new Conservative Buckingham, ditch HS2. You know you want to! Even without the latest news that some HS2 contracts are coming in up to 40% over their target price, a hike in the HS2 budget has been on the cards for a while – in fact this is an article I’ve been meaning to write for weeks. These statements rather beg the question of how the government can be so certain that HS2 will come under budget if they don’t know what the costs are, and what is being said behind closed doors about the HS2 costs. And then there was another oddity, in that staff salaries were being accounted for with a negative cost. City AM reported in May that the data published by the DfT shows “The total monthly cost of contingent labour, classified as agency (clerical and admin) staff, interim managers and specialist contractors for HS2 in February comes in at -£740,766.97.” Both the DfT and HS2 Ltd refused to give the actual figures or explain why it was negative. And a few days ago, the Canary spotted that the Chris Grayling announced that the government would be underwriting at least £12m of risk over the HS2 rail project. They are also unhappy that not only did he give a multi-million-pound guarantee to a private rail company, but also he sneaked the announcement out without consulting parliament first. All of those were already public before the New Civil Engineer article on the 12th June, in which they report that the interim contracts submitted are coming in significantly over the budget for this phase of work of £6.6 billion. The NCE says ‘one source said that the collective price was coming in at “around £1.2bn” over budget, another said that some bids were “as much as 30% to 40%higher” than their individual target price. The NSE adds that some contractors are being told to “go away and sharpen their pencils”. Of course, we’ve been here before, when David Cameron appointed David Higgins as chair and ask him to reduce the price. The resulting HS2 Plus document dropped some elements of the project and said the existing budget was right: no price reductions possible there. So it seems increasingly likely that there’ll be a HS2 price rise at some point over the next few months. An ever more costly white elephant when there would be so many better ways of spending the HS2 budget. I’ve just come back from several weeks in Austin, Texas. This wasn’t a holiday as such, but I was mostly free to please myself and do whatever I fancied. I had various guidebooks, and there is an array of websites with suggestions. The big tourist things – Lady Bird Park, the State Capitol building, the Bob Bullock museum – are in all these books. But there were some other things, such as quilt shops and the Treaty Oak, which would be interesting to me, even if they aren’t in the standard guidebooks. Without a list I might be almost next door to a good place to go and miss it, because I wasn’t thinking about it at the time, or hadn’t checked the website for the address. So I wrote myself a little travel guide of these other things and took a couple of copies with me, one permanently in the rental car, another in my handbag. I didn’t go everywhere in my guide (none of the star parties, for example), and it is not the definitive list of top sites. But having gone to the bother of creating it in a nice format for printing, I’m putting it out there for anyone else who is interested. I’m happy for anyone to print out copies for themselves, but it should be noted that some of the chunks of text are basically cut’n’pasted from websites (but probably edited for brevity), so don’t use it commercially. Also it will get out of date as soon as the first shop changes their hours. 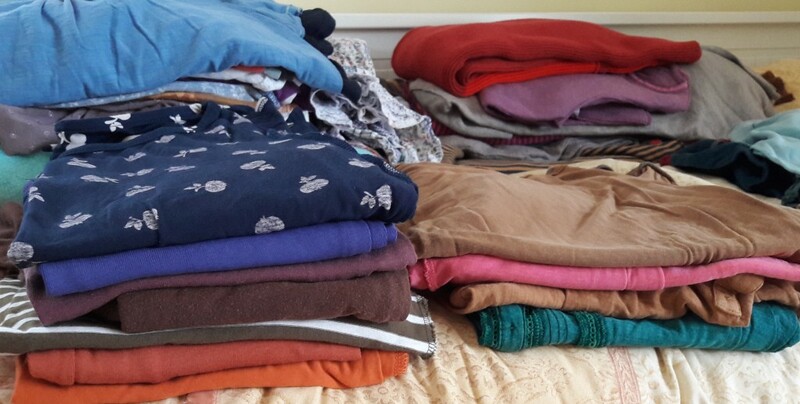 This is my experience of my autumn seasonal swop of my clothes: specifically how this year’s swop is spurring me to get rid of things. It helped that we took our annual summer holiday in September, missing much of the summer to autumn transition in the UK. I had a week at home, before a trip to a party conference. As I lugged my heavy suitcase into the hotel and hung the clothes up, I really felt I’d overpacked for the conference. Partly that was planned, with multiple changes of clothes: I’d always intended to swop my travelling top into something smarter (although the top I’d been wearing was smart enough). But partly it was because I had blouses I rarely had the opportunity to wear, and was desperate to actually use them. One blouse I’d worn once before. It was soft and silky, dark in colour with a subtle flounce. I’d stalked it on the website, checking it up, watching as it went into clearance, swooping in to buy when the price fell to an amount to I felt I could justify. And at last it was its turn to be worn again. It gaped. The flesh of my bosom was clearly visible, and not in saucy, cleavage-bearing, alluring style, but in a frumpy, badly fitting, unflattering style. I put on the camisole top I had with me, and tried the blouse again. The blouse still gaped, still as unflattering as before. I put on my jacket – the overall look was still frumpy. I took off jacket, blouse, camisole and then put on a shirt I had already worn for an evening. The lovely, silky, frumpy blouse went back in my suitcase, to be discarded when I got home. Time to put my summery clothes away until next year, and pull out my more autumnal ones. Looking in my drawers, I realised the small selection in circulation included several I didn’t much like, but there were a lot more I did like going unworn. Time for radical action. I took everything to my daughter’s room. (She’s at university, so the bed is free at the moment.) I made piles. Warm clothes for the depth of winter, cool clothes for hot summer, tops for for the end of summer, tops for the start of autumn, any of which I might not wear in an ordinary October. There were more piles of shirts and long-sleeved t-shirts. Enough, dare I say it, to wear a different clean top every day for the rest of October and into November. So that was the first rule of the declutter: a different top every day for the rest of the month (as I work from home this is easy for me to put into place). 3) Did it suit me? The first three rules are self-explanatory, and would probably be enough to make a decision. The final rule over-rides the rest: if I really liked it, I could keep it, and if I felt ‘meh’ for whatever reason I could get rid of it. By the second day, five tops were in the ‘go’ pile, even without putting them on. Three were just ‘meh’, one was worn and the other uncomfortable. Interestingly, one top I’d expected to get rid of stayed: I’d bought two at the same time, and one was worn out, so I never wore either. Getting rid of the worn out one meant I knew the other was fine, and could start wearing it again. The experiment continues. Shirts are being kept: shirts are being discarded, along with a pile of unfashionable jeans. Space is being made in my wardrobe. Coloris is a multicoloured DMC embroidery thread which the manufacturers describe as “combining four complimentary colours in each skein of six stranded cotton”. They are very pretty and you can do interesting things with them. What I hadn’t seen in any of the publicity was that the colours in each Coloris thread match to a set of ‘ordinary’ DMC embroidery colours. So I was interested to come across a table of Coloris number and the matching cottons. However, the information was a graphic in a PDF file, so not easy to point to for reference. It’s in here, on page 8. After much searching I also found it at the end of a long page on a French website. I can see all sorts of uses for this information. The obvious one is to use Coloris in one part of a design and the matching DMCs in another part. But more interesting might be to use one strand of Coloris and one strand of the matching DMC together for a more subtle shading. I was in the middle of writing this when the news about Jo Cox’s shooting broke.The official campaigns haven’t re-started yet. One can hope for a kinder politics, but will the leopards change their spots? Way back in February, Question Time was due to be filmed locally to me in Poole. It was just after the referendum date had been set which was clearly going to dominate the decision, so as part of the application process, you had to say whether you would vote in or out. Now, I will be voting Remain in spite of the campaign. I don’t want to be associated with them, because their campaign exemplifies the worst type of politics, a factor I’m sure has contributed to Remain’s poor showing in the polls. The thing is, many of the tactics used are surprisingly similar to the tactics used by politicians to push HS2 through – the personal attacks, the dodgy statistics and the ‘independent’ reports published by organisations with a vested interest. These tactics were almost certainly not invented for HS2. But like most people most of the time, I wasn’t taking a detailed look at campaigns for or against specific issues, so I didn’t notice them. However with so many people with a vote on the EU referendum, and no clear party line to adhere to, ordinary people are taking a lot of notice of the Remain campaign’s tactics, and they don’t like them. I’m not saying of course, that the Leave campaign is a model of perfect civility and pleasantness, but then my alternative to voting Remain was always going to be abstain. I wasn’t going to be out campaigning for them anyway: I wasn’t going to try and persuade people to vote Leave. The whole of David Cameron’s strategy seemed to be backfiring, with trust in David Cameron himself plummeting in a matter of months as the Remain campaign he is leading gets nastier. You have the so called independent reports which when you dig a little deeper are from people who are funded, directly or indirectly, from the EU. You have the personal attacks on the politicians. And anyone who might vote for Brexit is also vilified, by association with the worst villain of the day. Oh and the threats of war, pestilence and the fall of Western civilisation (thank you Donald Tusk) if we vote for Brexit – nothing unbelievable there. There has been no vision from the Remain campaign. Or at least, there is no vision of what staying in the EU could be like if they win. There is a vision from Leave who are perhaps overboard on promising a land of milk and honey – you may not believe they can deliver, but the vision is there. The only vision from Remain is the fire and brimstone they claim would result from a Brexit vote, with Osborne’s vindictive emergency budget a prime example. When politicians campaign like this on individual policies which they are determined to get through regardless of the merits, it often passes unnoticed by all but a few. But this is just the same on a bigger scale – and with a lot more people looking at it simultaneously. It’s possible Remain would have won, even without the shooting on Thursday. It’s possible that dreadful event has made enough difference to enough undecided voters. However much of the Remain campaign has been so unpleasant no wonder it has been losing ground. There might have been a case to make for the EU: perhaps the idea of British skepticsm being needed in the heart of Europe, or perhaps that the sweep of history is towards closer ties. Nobody has made the case. I’m voting Remain in spite of the campaign, not because of it.